New York Times bestselling author William Kent Krueger joined the ranks of today’s best suspense novelists with this thrilling, universally acclaimed debut. 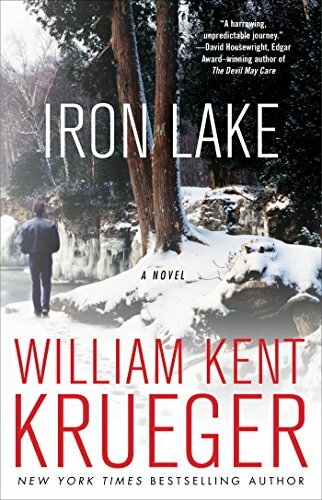 Conjuring “a sense of place he’s plainly honed firsthand in below-zero prairie” (Kirkus Reviews), Krueger brilliantly evokes northern Minnesota’s lake country—and reveals the dark side of its snow-covered landscape. Short-story specialist Krueger brings a fresh take on some familiar elements and a strong sense of atmosphere to his first mystery. Chicago cop Cork O’Connor and his wife, Jo, a lawyer, moved back to his northern Minnesota hometown of Aurora to improve their quality of life, but it didn’t work. Cork became the sheriff but lost an election after a disagreement between local Indians and whites over fishing rights turned deadly. Then his marriage broke up, with Jo becoming a successful advocate for tribal rights and Cork reduced to running a scruffy restaurant and gift shop. As the book starts, Cork, feeling guilty about sleeping with a warmhearted waitress, is still hoping to get back with Jo and their three children. Drawn into the disappearance of an Indian newsboy, which coincides with the apparent suicide of a former judge, Cork quickly clashes with some well-connected foes: a newly elected senator (who also happens to be the judge’s son and Jo’s lover); the town’s new sheriff; and some tribal leaders getting rich on gambling concessions. When an old Indian tells Cork that a Windigo (a malign spirit) is fueling events, it becomes an occasion for Krueger to draw some nifty connections between the monsters of the heart and the monsters of myth. Krueger makes Cork a real person beneath his genre garments, mostly by showing him dealing with the needs of his two very different teenage daughters. And the author’s deft eye for the details of everyday life brings the town and its peculiar problems to vivid life. The first Cork O’Connor mystery introduces him to audiences and tells an entertaining story about secrets hidden in a small Minnesota town. Cork is part Anishinaabe Indian, has friends and mentors in the tribe, but has been the sheriff of Aurora enforcing white men’s laws. After a confrontation between whites and natives that caused him to kill a white resort owner, he lost a recall election. He has been deeply grieving which caused him to lose his marriage. Cork has started a new relationship with Molly Nurmi but hasn’t given up hope of rebuilding his marriage to Jo in order to keep his relationship with his children. When a woman in town asks him to help locate her missing son, Cork finds himself in an investigation that leads to the death of a prominent and heartily disliked judge, Minnesota militant groups, Indian casinos, and small town corruption and secrets. I liked the setting. I liked Cork who was a man who fought for justice more than he fought for the law. I’ll be reading more of the series which has now reached sixteen books. An excellent story built around crimes in the small town of Aurora, Minnesota which borders a Native American reservation and casino. Cork O’ Connor, the newly “unelected” sheriff takes it upon himself to discover why a young boy is missing and who killed the retired Judge. If you’re looking for a “Jack Reacher” type character this is NOT the book for you, but if you like a good solid crime story and well-developed characters you may find, like I did, that you can’t put this book down. Looking forward to reading more of this series. Enjoy this very satisfying look at contemporary Native American culture and its interaction with neighbors in the great White North. The book is a good mystery-who done it, with strong characters and plot twists. There may be some heartbreak along the way. Hard to put this book down. Cork has neglected his relationship with his wife after losing his position as sheriff, too depressed to get out and get votes because of having killed someone with his gun. He loses his job, and then his wife. The people of the area still depend on him from time to time in matters of the law, so he gets involved when a boy goes missing. The thinking is his father has shown up and abducted him, bringing him to the reservation. Cork gets involved and things going on in town begin to unglue. People begin to die. A Windigo begins to whisper names on the wind.